The Talk! Speech Synthesizer App for iOS is a lot of fun. 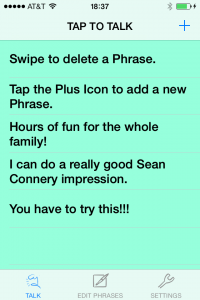 Add some fun phrases or words that you like to say a lot and let your device speak for you. Enter Any Phrase You Like! Open the app on either your iPhone or iPad and tap the + sign to add a new phrase. Once it’s been stored just tap the phrase and your iOS will begin to speak your phrase back to you. Keep adding as many phrases as you like. You can also change the language and hear your phrase in your particular dialect or try some out just for fun. Select from British, American, Australian, German, South African, Irish to name but a few and choose whether you would like a male or female voice. 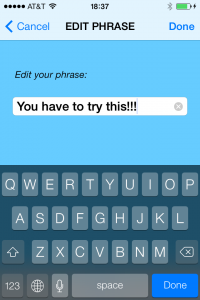 Add lots of phrases and speak to your friends via the Talk! Synthesizer. There’s also an option to change pitch and speed rate so you can play around with a high or low voice and make the voice speak really fast or ultra slow. The app is currently available for iPhone but you can supersize it to fit the iPad screen for now. There are plans to release an iPad interface as well as iCloud integration to make it easier to share your phrases across multiple devices. You can download Talk! Speech Synthesizer on the App Store. Check it out today and enjoy!